Rendering is always a time-taking task, no matter what application you use. SketchUp offers some easiest solutions that not only make your design better than others but also speed up your modeling process. Proxy components are such time-saver feature that allows you to work faster on your model and get a picture realistic rendering. Proxy component, in SketchUp term, is used to replace objects with high-poly counts so that you can avoid the delay to complete the rendering. Saving time in rendering will let you focus on other designing detail of your SketchUp. You can use both low-poly and high-poly count in Proxy component as per your requirement. Creating models and setting their views will preferably be done with the low poly version. The high-poly count is used for the rendering that maintains the quality of the picture. Current components of your model get the required replacement with this feature. You can use the same name for replacing your current component with low poly and high poly geometry. You can also create a new component with a different name that has high-poly layer in the original form and low poly geometry in low poly layer. How to create a Proxy component: Creating a proxy component follows simple steps. Right a click on the component you want to replace and choose Create Lo-Poly Proxy Component from RP Tools submenu. You need to select the options you want for your model and click ‘OK’. After clicking Create Lo-Poly Proxy Component option, you will get a dialogue box containing all essential details that you need to choose. Criss-cross proxy object can be restored to the previous position with choosing restore component from Lo-Poly proxy. • Criss-cross images – As the name says, your model will appear in crisss-cross look for thumbnail image. • Block with images – it blocks the images of the original component. • Wire Frame Block – wire frame blocks will replace the components you select. • Low-Poly On – component with low poly geometry will be displayed. • Hi-Poly On – the original component and geometry will be displayed. • Both on – both layers are turned on in your model. Proxy components solve the most complex problem while designing on SketchUp. Rendering always takes times and it slows the system. With this feature, you can easily avoid the issue and make your rendering better and faster. Here is also a link of a video tutorial that will guide you on how you can create proxy components. Landscape planning is a most needed step, especially for a new home. Expert designers carve out the best plan for a landscape after analyzing the views, activities and environments of the location. Traditionally, the plan is designed with pencil and paper that is not only time-taking but also ineffective for redrawing. Though it is considered to be the organic way of a design, today’s designers are looking for easy alternatives. Professional landscape designing software applications are designed by companies to help designers add details as perfectly as they visualize. Landscape designs on paper are more like an artistic job where designers consider and measure each detail very carefully. The downfall of such designs is nothing but a lack of efficiency. Redrawing of the designs is time-consuming, and getting a proper visualization is also very difficult. 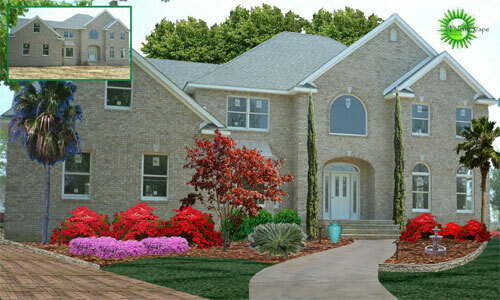 3D landscape design software applications are growing in numbers with time. The useful applications and tools carry everything that is needed to make a proper plan for your landscape. Google SketchUp proves to be handy as it allows even beginners to design like an expert. Drawing landscape on paper does not communicate well with the clients. The plans even fail to cut the mark due to the lack of clarity. This is why landscape designing software applications outrun the former one and make a strong place in the designing tool of the planners. These software applications are also not free from shortfalls. Students and designers who are confident on designing in a conventional way feel uncomfortable with these tools. They need to go through an extensive training program to learn the application first before drawing a design using the tools. The applications are costly and they require a timely update. The above-mentioned problems of 3d landscape design software are minor ones that can easily be eliminated. The benefits of these applications are countless and they bring the profit-driven result also. A better communication with the clients is established by the software application. Advantages make you convinced that professional landscape design software application is a necessary tool for the designers. You can develop a master plan with colors and details that add a real look to your model. Editing any part of your design is not worrisome; rather it is an easily executed work by the designers. Creating perspective photo through pencil is a hard and time-consuming job, and the end result is also not as clean as the design done by software application. You can prepare a virtual photo of your design with all meaningful aspects. 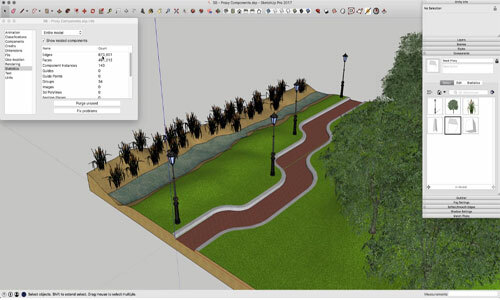 Trees, flowers, sidewalks and other necessary details of landscape design are preloaded in the software application so that you can drop them in your design as per you like. Generally, 3D designs software tools like SketchUp come up with all important things required for designing a landscape. Companies, though, go further and create applications specially designed for sketching landscape digitally. 3D images and designs take clients to the virtual landscape and give them a real-time thrill to walk through the design. VBO Solutions develop VBO Piping, a useful sketchup extension that generates pipes from edges in selected groups/components as well as includes fittings to vertices. It has the capability to update after edit the source (group/component of edges), and replace/edit the fittings, size etc. The plugin supports SketchUp 2017, SketchUp 2018. – “Create Pipes Branch”: All inside edges of selected group(s)/component(s) will be converted to pipe with options (collection, size, type of ending fitting and continue fitting) and are chosen in an input box. – “Branches modifier”: It refers to a tool that facilitates to edit fitting. The user will be able to rotate, replace fittings by hand, add/replace & reduce bush, redraw branch(es). Besides, specify name and add color to any branch(es). – “2D/3D”: A rapid changing for showing the branches in 2D/3D view, stand on turn on/off the layers “8_mep_piping2D” and “8_mep_piping3D”. – Double click (Edit Group/Component) to a branch will facilitate the user to edit the source edges and vertices. The branch will be updated to it’s “settings” as soon as the Group/Component editing will be finished by the users. – Can generate a BOM (Bill Of Materials) of pipes and fitting by applying preset “PIPING” in VBO_Schedule Plugin. In this sketchup video tutorial, Minh from Architectural Inspirations, presents a useful video that shows how to use shapespark for creating rendering in real time. The software also facilitates the users to observe their renderings on any browsers. With Shapespark, it is possible to generate and distribute real-time 3D visualizations that can operate through any modern web browser as well as on mobile gadgets, devoid of any plugins. The visualizations are generated in the Shapespark desktop application and then uploaded to the Internet with the purpose of distributing and implanting on websites. SketchUp is supported via a devoted extension that facilitates to export a model to Shapespark without any difficulty. This sketchup extension is compatible with SketchUp 2015, SketchUp 2016, SketchUp 2017. To watch online demonstration, go through the following video. In this sketchup video tutorial, you will learn different processes to generate a split or radial style overlay in sketchup with the use of SketchFX. It facilitates the users to apply layer styles on top of each other to provide new effects in sketchup. The entire tutorial is created by using sketchup 2017. SketchFX assigns artistic rendering to SketchUp. With the simple click of mouse, it is possible to make elegant previews of your models, selecting from a wide array of custom-made presets (watercolor, pencil, depth-of-field, motion-blur and various others)..
SketchFX is available in two versions like SketchFX Pro and SketchFX Ex. Numerous filters exist to form your own effect which range from hue-saturation-value, brightness-contrast, gamma-exposure, blur, radial blur, bloom, fog, depth of field, vignette, artistic paint, image from file, scene, style and constant color, scene transition, masks. To learn how to give layering styles in sketchup with SketchFX, watch the following video tutorial. This is an excellent video tutorial for sketchup vray users. The tutorial briefly explains how to use v-ray 3.4 in sketchup 2017 along with photoshop to perform interior rendering of a bedroom. The rendering is done through v-ray asset editor. The V-Ray Asset Editor contains four different tabs ranging from Material Editor, Light Editor, Geometry Editor, and Render Settings Tab. These can be utilized for controlling V-Ray assets and settings. Asset Editor Button is available in V-ray Toolbar. One can also avail it from Extensions > V-Ray > V-Ray Render and Options > Asset Editor. Material Editor tab provides information and manages all the materials in the sketchup scene. Light Asset Lister/Editor tab comprises of information and manages all the lights in the sketchup scene. Geometry Asset Lister/Editor tab comprises of information on v-ray geometry assets in the sketchup scene. V-Ray Render Settings tab provides controls for the V-Ray renderer.